Husky jumping is a very common problem with not only this breed, but virtually any dog breed. Huskies love to jump on their owners to greet them. When they’re puppies, this may seem cute or amusing but reinforcing this behavior will result in it becoming a nuisance when they grow into large adults. Many owners positively reinforce Husky jumping without knowing it because it’s so hard to resist a cute little puppy when he happily runs towards you with his tail wagging and puts his paws on your knees. It’s not until they become adults that owners no longer find this behaviour amusing. Understand that this is normal canine greeting behaviour and that they should not be punished for it. You don’t want to teach your Husky that greeting people is wrong. Instead you should teach your Husky the proper way to greet people. 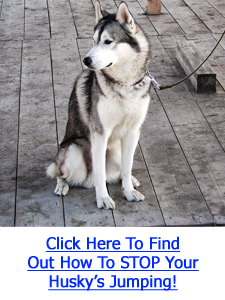 Click Here To Discover How To STOP Your Husky’s Jumping Problems For GOOD! Huskies jump up to greet people because they want to make eye and physical contact. They are not interested in looking at your knees or legs! Jumping is a natural instinct for all dogs. In the wild, puppies jump and lick the muzzles of adult dogs in order to get food or greet them. Puppies carry on this behavior to adulthood as can be seen when adult dogs greet each other face to face by licking each others’ muzzles. The way to correct Husky jumping is to first teach your Husky the “sit” command using lure and reward-based methods. Practice the “sit” command in any area where your Husky is expected to greet people. Have your Husky confined in a crate while you invite a visitor inside the house and have them sit in a comfortable chair. Next lead your Husky with a leash up to the visitor. Hold onto the collar or leash to prevent your Husky from jumping up. Give your Husky the “sit” command and even a hand signal. Have your visitor wait until your Husky is sitting before rewarding him with attention by petting and talking to him in a sweet voice for a minute. Keep holding onto your Husky’s collar or leash to ensure that he does not jump up. Your Husky will probably not sit right away, and especially not the first time you attempt this. If he doesn’t sit, just wait until he does. No petting or talking from the visitor should happen until he is sitting. As soon as your Husky is sitting, the visitor should reward him with attention. Repeat this by walking your Husky away and then returning to go through the procedure again. If you practice correcting Husky jumping with all of your visitors, your Husky should quickly learn the proper way to greet them.